Nothing to dislike, but it’s all down to whether cover versions float your boat. This review presents me with a dilemma; on one hand I’m a big fan of Unitopia’s albums yet on the other I struggle to understand the merit or rationale for covers albums and the audience at which they are aimed. I can think of only a few examples where a classic song has been improved by another artist’s efforts (Talisman with ‘Crazy’ and ‘Frozen’ spring to mind) so I approached this album with some trepidation; not least when I saw the inclusion of ‘Calling Occupants Of Interplanetary Craft’ (Klaatu), which is a song I cannot abide. That opinion isn’t changed by the version on offer here. The album opens with a short orchestral piece, ‘Signs Of Life’, which could be a concert intro tape; the aforementioned ‘Calling…’ is up next followed by one of my favourite songs, Marillion’s ‘Easter’. 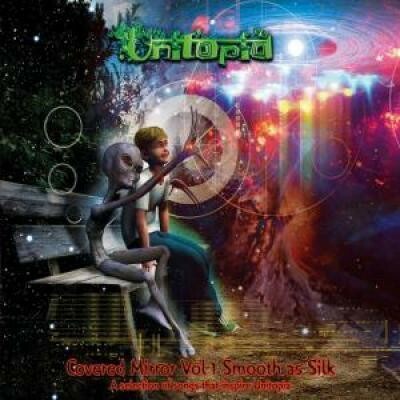 Unitopia perform it pretty straight vocally and Mark Trueack’s vocals do the track justice but the guitar solo on the original is iconic so the attempt to do something different with it here doesn’t add anything. ‘Man Of Colours’ (Icehouse) is a less obvious choice for inclusion and is probably one of my album highlights as a consequence. Trueack’s vocals on this one are tremendous and he really owns the chorus. They are, however, playing with fire by doing medleys of Genesis and Yes material although interestingly their version of a lesser know song by the former, ‘The Silent Sun’, works the best of those they have chosen to include. There’s nothing wrong with their tweaking of ‘Supper’s Ready’, ‘Moonlit Knight’, ‘The Lamb Lies Down…’ and ‘Carpet Crawlers’, in fact all are done well and make for pleasant listening, I’m just unsure why one would choose to listen to these versions rather than the originals. Led Zeppelin’s ‘Rain Song’ is up next and is given a fairly radical makeover. Santana type drumming is overlaid with a light Jazz-style vocal arrangement that gives a Cabaret feel to proceedings. Another highlight is Supertramp’s ‘Even In The Quietest Moments’, which probably usurps the original thanks to the lower register in which it’s sung. The use of an indigenous instrument, the didgeridoo, is actually rather cool and Trueack’s vocals, the chiming acoustic guitars and piano evoke early Genesis. ‘Can We Still Be Friends’ from Todd Rundgren is a fine rendition with a well created multi-part vocal arrangement while ‘Speaking The Truth’ is a flute interlude leading into a restrained version of the Korgies ‘Everybody’s Gotta Learn Sometime’ featuring a fine guitar solo. Like the Genesis medley the Yes one is well conceived but cannot improve on the originals, although their take on ‘Owner Of A Lonely Heart’, played as a ballad, is neatly done. Alan Parson’s ‘To One In Paradise’ is a delightful rendition whilst Trueack brings pathos to The Flower Kings’ ‘The Way The Waters Are Moving’. There’s really nothing to dislike about what’s on offer here; it’s all down to whether cover versions float your boat.